It’s not often that you get rewarded for buying a new tractor with a free Harley Davidson Sportster Iron 883, but that’s just what Case IH is offering to every customer that buys a Puma Long Wheel Base CVT tractor before March 31. The Case IH Puma CVT range of tractors features 5 different models including the range topping 185 kW (251 hp) Puma 225 with CVT (Continuously Variable Transmission) fitted as standard. All of the other tractor models in the Puma range also have the option to be fitted with CVT. Case IH CVT technology provides smooth and stepless shifting. It works to automatically select the best gear ratio for the required speed. When the speed has been set the computer finds the perfect spot between fuel efficiency and power. Tim Fanning, Case IH Tractor Product Manager, says, “It’s simple, intuitive, easy to operate and most efficient when you really need it – working at field speeds. In addition, the transmission is designed so that 50 kph can be achieved at a smooth and quiet 1550 engine rpm, leading to reduced fuel consumption,"
The Puma CVT tractors also benefits from additional Case IH technology including ActiveStop technology and Diesel Saver Automatic Productivity Management (APM) logic. The Puma’s ActiveStop feature works to keep the tractor and load completely stationary, even on steep inclines, without the use of clutch and brakes. It is perfect for hay baling operations. APM is ideal for broadacre and spray operations. It automatically selects the optimal combination of transmission and engine speeds, improving productivity and saving fuel. 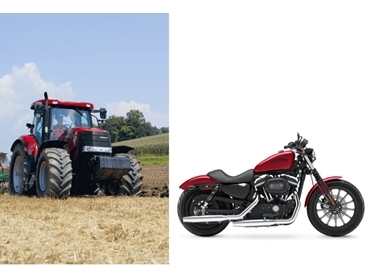 Contact Case IH or one of its expert dealers for more information on the tractor models in the Puma range and to receive a brand new Harley Davidson Sportster Iron 883 XL883N motorcycle, with “authentic ride” and black powder coated 883cc engine when purchase is made before 31 March 2012.